Health-care workers are injured on the job far more frequently than workers in any other field. Meanwhile, OSHA, the agency tasked with overseeing workplace safety, has not fulfilled its mandate to gather information and protect workplace safety for health-care workers. This is according to a new report out by the watchdog group Public Citizen, titled Health Care Workers Unprotected: Insufficient Inspections and Standards Leave Safety Risks Unaddressed. We’re now joined by two guests to talk more about this report. Keith Wrightson is an expert on worker safety and health issues for Public Citizen’s Congress Watch division. He’s performed research for Public Citizen on issues including the Texas fertilizer plant explosion, the Whistleblower Protection Enhancement Act, and worker’s injuries and fatalities. Thank you for being with us, Keith. We’re also joined by Karen Higgins. She’s the copresident of National Nurses United. She’s a staff nurse in ICU at Boston Medical Center and past president of Massachusetts Nurses Association. KEITH WRIGHTSON, CONGRESS WATCH DIVISION, PUBLIC CITIZEN: Thank you. NOOR: So, Keith, let’s start with you. Compare the rate of workplace injuries and health care versus more regulated injuries, and talk about how much these injuries cost the U.S. economy. WRIGHTSON: Well, first of all, I guess I’ll start off saying that the rate of injuries in the health-care industry far exceeds the rate of all other industries in the United States. Health-care workers in particular sectors, especially nursing home workers, are hurt more on the job than anybody else. An example of that would be in nursing homes that these workers are hurt at a rate of 28.2 times per 10,000 workers. However, the national rate hovers somewhere in the 3.8 range. So it’s seven times more likely that if you are working in a nursing home you’re going to be injured on the job than, say, somebody else who’s working, you know, as a bank teller or in a grocery store, or even on a construction site. So the rate far exceeds all other industries in the health-care industry. Now, these injuries come with an enormous cost. And, in fact, all injuries and fatalities cost the economy quite a bit of money. One study indicates that back injuries alone, musculoskeletal disorders and injuries, cost the economy roughly $7 billion each year. That’s a huge burden on the economy. And also, you know, the costs get returned back to consumers. So in the end we pay for everybody else’s misguided judgment. NOOR: I want to bring Karen into the conversation. Karen, can you give us your reaction to this report? And what are the most common injuries that health-care workers face? KAREN HIGGINS, COPRESIDENT, NATIONAL NURSES UNITED: Well, I think that our response is it’s a nice beginning. I mean, I think that hopefully, you know, OSHA plays a huge part. And we’ve been seeing OSHA kind of be deconstructed versus being more involved in workplace than we have in the past. So I think anything they can build OSHA back up and give them [incompr.] to get in is–to these places where injuries can continue to happen is important. But we still have concerns. I mean, we see in nursing alone a huge amount of injuries, and it’s mostly musculoskeletal injuries that we see. We talked about back injuries. It’s huge. They did a survey not that many–a couple of years ago and looked at nurses, and it was something like 82 percent of the people that answered the survey had back injuries and were working, and 52 percent of them were still working with back injuries. And there was 12 percent of them that basically have lost their employment because of back injuries, that they could no longer do their job. So it is a huge number. And we truthfully believe that one of the things that we need to look is to hold employees to–their feet to the fire to do more for injury prevention. Not enough is still being done, I believe, on the part of employees to make sure–it’s great to build up OSHA, but we have to also hold employees responsible for not putting things in place that can prevent these injuries from happening. To invest [incompr.] is to stop people from getting hurt and being put out of work. NOOR: Now, Keith, I want to read you the response that David Michaels, the assistant secretary of labor for OSHA, gave to your report. He said it’s unacceptable that workers who have dedicated their lives to caring for our loved ones when they are sick are the very same workers who face the highest risk of work-related injury and illness. Keith, what are the obstacles that prevent OSHA from adequately regulating and inspecting the health-care industry? Is it just their fault? Or who else is to blame? WRIGHTSON: There’s lots of burdens and barriers in the way of OSHA to fulfill its mission. There’s special attention given to the agency. Their rules and regulations are placed under a microscope far different than any other federal agency, which is pretty ironic. This is all a result of what is known as the Benzene Decision. It was a Supreme Court case that took place in the 1980s. And ever since then, this agency has been scrutinized far worse than any other federal agency. So there’s also problems in Congress with the rulemaking process. Every time–not every time, but on a few occasions, especially over the last five to ten years, OSHA has tried to create rules and regulations to help all workers and also health-care workers. On one occasion, Congress actually repealed the rule for ergonomic hazards and said that OSHA couldn’t do that. That’s a huge problem and a burden and a half, especially because, you know what, Congress isn’t as in tune to occupational safety and health as the agency that is put in charge to do so. So there are lots of burdens and lots of hurdles that the agency needs to overcome to get a rule put in place. Public Citizen ran a report last year, and we found that it on average takes 8 to 12 years for the agency to promulgate a standard and to get it put into place. NOOR: And, Keith, what role do lobbyists play in Congress’s inaction in overseeing what’s happening in the health-care field? WRIGHTSON: We can’t say for certain because we do not have all the records. It’s very hard to find out where the lobbyists are spending their money. However, you can do some investigatory work on your own. And I suspect that lobbyists played a huge role in any rules coming into the health-care industry. And that’s very problematic. The democracy here is supposed to be for the people and by the people. It’s not supposed to be for the people with the biggest checkbook. Congress really needs to consider the lives of workers who are the greatest asset to the industry. And it’s troubling that money can buy you anything in this city. NOOR: And, Karen, since the financial crisis, across the country, on a federal, state, and local level, budgets have been cut. Talk about how this has affected health-care worker safety. HIGGINS: Well, it’s huge. I mean, obviously, to most, you know, industries the bottom line is making money, making profit. At so, as they feel more of a squeeze, then what goes on is we lose more workers, which means that those that are still remaining are now doing twice or sometimes three, four, five times what they were doing before. And when you’re in a health-care environment and it’s a lot, as we know, mobilizing of patients, it becomes a huge problem. You know, we see some investment in equipment, but the problem is if the equipment is really not–you know, the cheaper version of the equipment is not–it’s really helpful to somebody to help move people, then the equipment that you just invested in doesn’t get used. And it’s a huge problem. And we as organization have been very much up front, you know, working on, you know, workplace violence, and also patient handling, which is a huge issue with us, because, again, we see so many injuries, not just back, but all kinds of different kinds of muscle-skeletal injuries. So it’s something we have worked on at the state level, at the federal level, trying to–because, again, I think, you know, we need to empower OSHA to be able to do more. We need to hold the employees responsible when they are not doing what they should be doing to prevent injuries. But we need to legislatively–and we need to put regulations in effect that in effect set that up, that there is obviously–if you’re not following the law or if you set up a law that, you know, we want to set–an example would be for patient safety for, you know, mobilizing patients–is to be able to say, you know, is it unsafe to move that patient, or an assignment that looks like it’s unsafe, can you refuse to take it and not be, basically, disciplined or fired because of it. How are we doing with teaching and education when we have equipment or other ways to move people? Are we really invested in doing that? Where are we with whistleblowing, which when it comes to people actually speaking out when things are not safe within a work environment? But there also has to be that net that allows that if they’re not doing it, what is the outcome? And it has to be something that is tangible and really, you know, holds these employees, you know, hold their feet to the fire that they do the right thing on behalf of the workers and keep them as safe as possible. And it shouldn’t be–you know, again, we have an agency that’s supposed to be there, but they’ve been, I think, pretty much, you know, pushed back, as, you know, Keith was saying, from being able to be effective and able to keep these employees responsible for making sure that not only do we react to injuries, but that we actually prevent injuries from occurring, which is huge. NOOR: And, Karen, what impact does health-care workers being sick have on the patients they are serving? HIGGINS: It’s a huge impact, because, again, where profit becomes more important than actual patient care, what happens is that there is no–you know, when you lose somebody that’s a worker, there isn’t anybody there to step in and replace them. So it has a huge outcome on patient care, because, you know, the less there are of workers, the less that we’re able to do on behalf of patients, which is very discouraging and it’s very upsetting to most of us that, you know, our whole focus is patient care and being able to deliver the kind of care patients deserve. And when you don’t have the resources to be able to do that, whether it’s because there’s not enough nurses, there’s not enough other people there as far as health to be able to, you know, whether it’s mobilize patients and make sure, you know, just because of skin issues, getting them out of bed and things like this is huge. So it ultimately really has a huge effect on patient care. So, you know. And again, it all trickles down. And in the end we don’t want patients paying for the fact that, you know, they’re not getting the care that they deserve or that they’re actually developing sores and things like that because we don’t have either the right equipment or, you know, things put into place to be able to help us patients easier or take care of patients easier. And again, when people are out, they’re not replaced. It’s not that easy to have somebody come in and be able to just pick up and, you know, take over where somebody else has an expertise in the field and is now gone. NOOR: And, Keith, we’ll end with you. You’ve just completed this exhaustive study. What are the next steps that need to be put into place, steps that need to happen to address these issues? What are you calling for today? WRIGHTSON: We’re calling for a few things. It’s definitely a multifaceted approach. First of all, Congress starts to need to pay attention to the burden of injuries and illnesses, not only in health care but in all of industry. So that’s important. We would like to see the agency, that is, OSHA, include hospitals and their national emphasis program. Currently it only targets nursing care facilities, so nursing homes. We would like Congress to increase funding for the agency so no other workers are denied their rights under the OSHA Act, which entitles them to a safe and happy healthy workplace. We would like rulemaking to commence on safe patient handling. We believe that the ten states that currently have these laws in place have provided an excellent pilot for their [incompr.] and we think that the federal agency should move forward immediately on safe patient handling. We also feel the same way about workplace violence. A standard should be created or promulgated for that area. And also the bloodborne pathogens act, given its outstanding success, should be expanded. The rule is currently under regulatory review, and we are expecting an expansion of that labor standard in the near future. So we would love to see that happen. NOOR: I want to thank you both for joining us. Keith Wrightson is with Public Citizen. 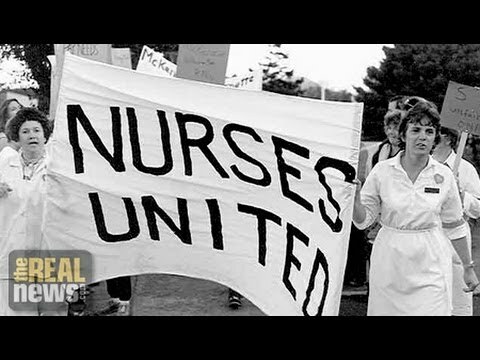 Karen Higgins is copresident of National Nurses United.